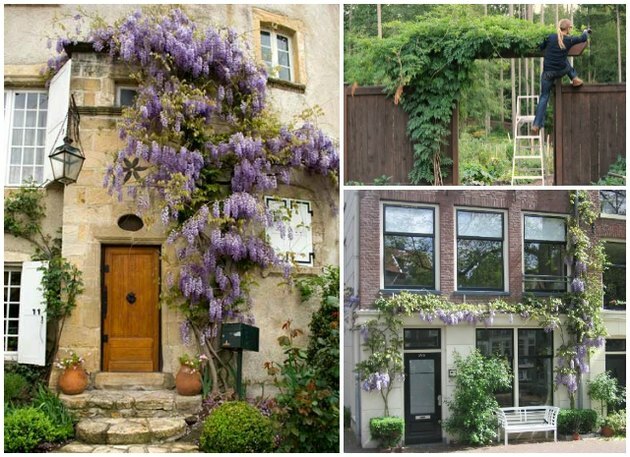 By planting wisteria in a contained planter, you can grow and train these beautiful flowering vines without making a permanent mark in the ground or crowding nearby plants with what can typically be known as an invasive vine. 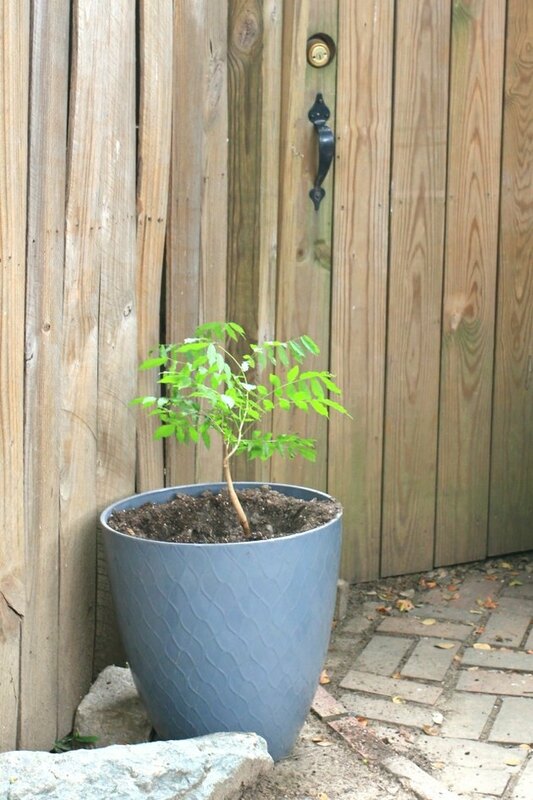 Best known as plant covers to offer shade and visual interest around arbors or pergolas, potted wisteria is great for small spaces, rentals, urban spaces or general decorative appeal. We added a DIY over-the-fence arbor (made of PVC pipes spray painted black) to help train the growth. Best planted in the spring or fall seasons, wisteria plants thrive in full to partial sun, with the best success among USDA hardiness zones 4-9. 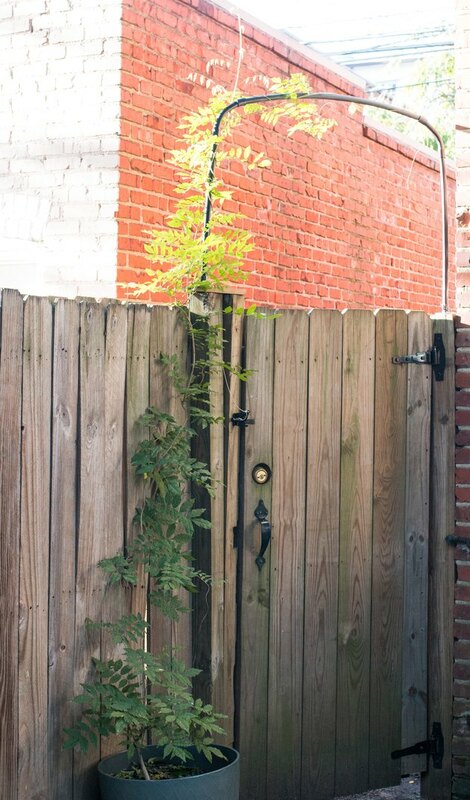 When planted in the appropriate conditions, Wisteria will grow fast as a vining plant, some reaching up to 10 feet of new growth within a year and blooming in the spring. It can be grown into a tree, trained to shape a shrub or carefully pruned into a bonsai version of the plant. 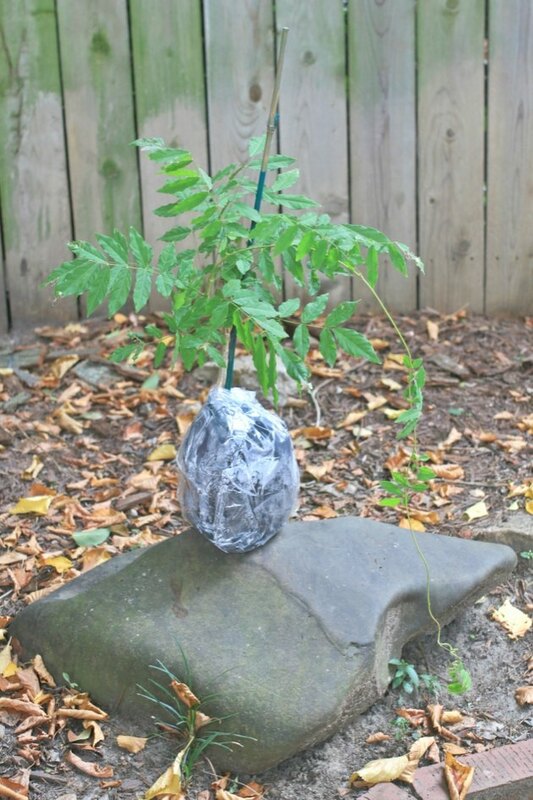 *It's common practice to plant wisteria from a propagated live starter plant. When grown from seed, it can take between 10 to 15 years for the vine to produce blooms as compared to 3 years when using a live starter. 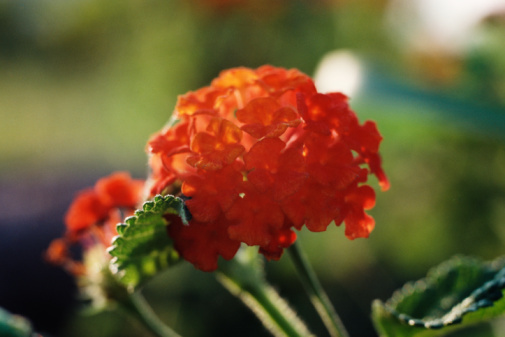 Look for starter plants at your local nursery or find them online. To provide ample room for planting and new growth, choose a planter with a depth greater than the starter plant's root ball and with a width that is 3 to 4 times wider. 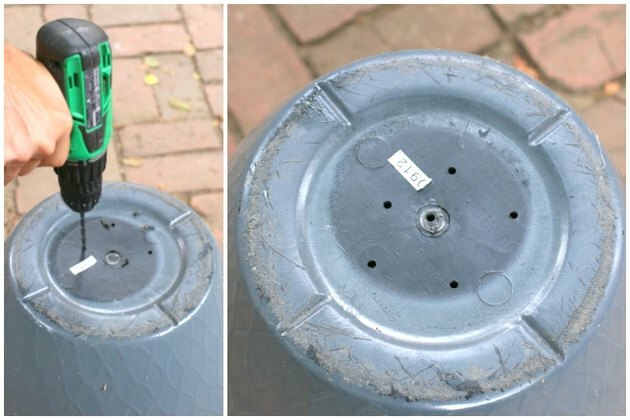 If the planter lacks drainage, turn it over and drill 5 holes into the base using a ⅛-inch drill bit to create drainage holes. 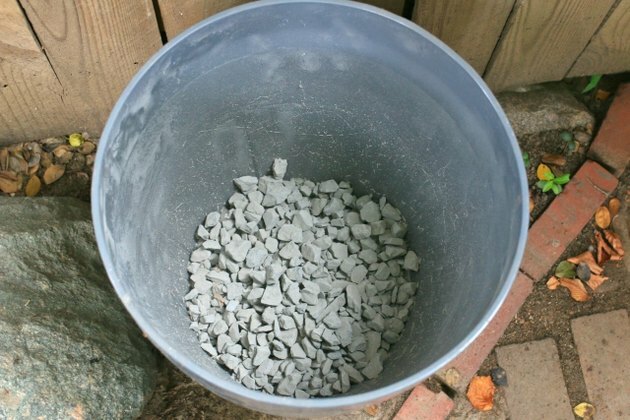 Turn the planter back over and fill with a three inch layer of drainage rocks. Doing so will help the entire system provide better water drainage, which will help support healthy plant growth. 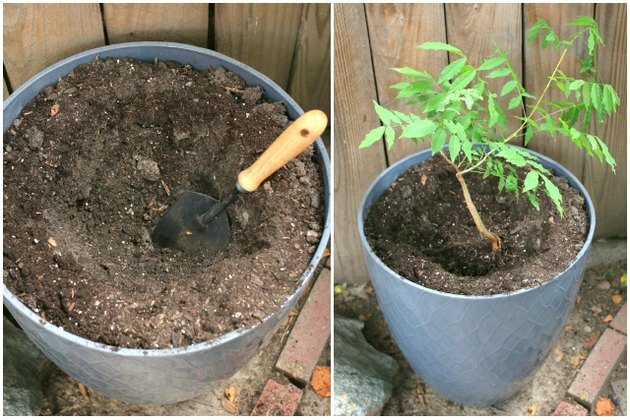 Begin layering in the potting soil, leaving enough room to form a well for the starter plant. Nestle the plant into a hole as deep as the root ball, and then fill the remaining planter to cover with soil. Plant wisteria as deep as the root ball. Place the planter in an area that receives full to partial sunlight and give a full initial watering to soak the plant and soil. 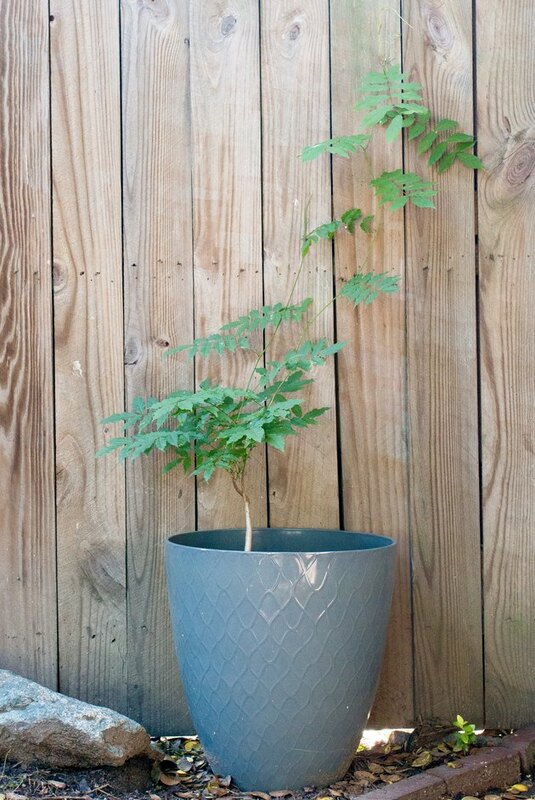 To promote a cultivated look, begin training the vines by securing to a support in the potted plant or hooks along the wall area while the plant is young. Once planted and showing signs of new growth, wisteria is incredibly tolerant of soil and temperate conditions. While regular watering, access to sunlight and lower exposure to cold are all best practices, the reality is that this vining plant can grow rather aggressively with minimal care — so remaining conscious of seasonal pruning will help keep the invasive nature at bay and the beautifully trained plant in full swing. The vines will shoot new growth with fanned leaves and flower in beautiful purple bunches, reminiscent of grape clusters. After flowering, the wisteria will produce oblong velvety seed pods that will hang and frame the plant covering. **Looking for more creative gardening ideas? Learn how to make modern concrete planters or this edible potted garden that just keeps giving.